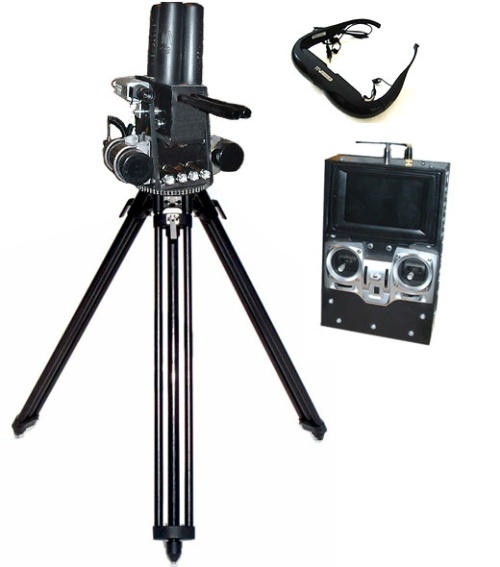 A custom made double barreled paintball gun, sitting on top of a mechanized pitch and yaw mount bolted to a big tripod. A camera mounted on top with shots powered by CO2 with 200 rounds on top. You can control it from 8 meters away, so you can hide while shooting. Imagine taking out all the kids on the block without having to see them with ample amounts ammo. You can really terrorize the neighborhood and other areas, there is even a possiblity of mounting this to the bed of truck.